This rice vermicelli is lightly flavored and made with shrimp, egg, and vegetables. Enjoy delicious rice vermicelli whenever you want it, without needing to set aside a lot of time for cooking! Simply microwave, allow bag to deflate, stir-fry briefly, and enjoy. 400g total (two 200g servings). Though the word vermicelli is Italian in origin, it is a term used today to describe a wide range of noodles from different parts of the world; usually long and thin in shape. 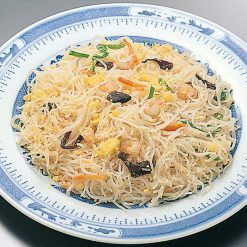 This rice vermicelli is lightly flavored and made with shrimp, egg, and vegetables. No need to worry about the time-consuming process and messy cleanup of scrambling eggs and preparing vegetables – Sugarlady has taken care of all that for you! Sugarlady’s prepared frozen foods are created with the goals of top-quality flavor and convenience, allowing you to eat well even on your busiest days. 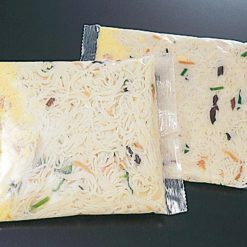 Remove the flavored rice vermicelli (still frozen) from its outer bag. Without removing it from its inner bag, place it on a microwave-safe plate with the indicated side of the bag up, and cook as follows. In a 500W microwave, cook for about 5 minutes 30 seconds. In a 600W microwave, cook for about 5 minutes.Do not microwave in outer bag. The inner bag may puff up while it is being microwaved, but it will deflate on its own, so there is no need for concern. Do not remove the bag from the microwave until after it has deflated. After microwaving, briefly stir-fry the flavored rice vermicelli to make it still more delicious. This product contains rice vermicelli, vegetables (onions, bell peppers, carrots), scrambled eggs, shrimp, sunflower oil, wood ear mushrooms, flavoring extract (chicken, pork, wheat gluten), table salt, soy sauce, sugar, trehalose, thickener (pullulan).. This product is not suitable for anyone with allergies to egg, wheat, shrimp, soy, chicken or pork. Origin of ingredients: shrimp (Vietnam), onions / bell peppers (domestic). Prepared and packaged in Japan.